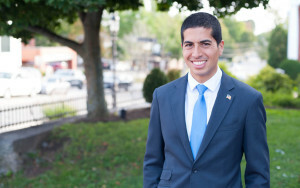 ANDOVER, MA – Laborers Local 175 and Laborers Local 609 both endorsed Dan Koh today in the 3rd District Congressional race. Local 175, based out of Methuen, represents more than 1000 members and Local 609 represents over 500 members. In total, Koh has received endorsements from seven unions, more than any other candidate. Koh has also been endorsed by IBEW Local 96, IUEC Local 4, Laborers Local 88, Building Wreckers Local 1421, and Operating Engineers Local 4. A native of Andover of Korean-Lebanese descent whose great-grandparents came to Lawrence over a century ago, Dan is dedicated to preserving the American Dream that made his own story possible. Dan most recently served as Chief of Staff to Boston Mayor Marty Walsh, where he managed 18,000 employees and a $3 billion budget during one of the most prosperous four-year stretches in Boston’s history. In Congress, Dan will stand up to President Trump and promote universal healthcare and a forward-looking jobs program so that everyone can get ahead.